How Does Jell-O Gelatin Work? Jell-O gelatin is a tasty jiggly treat that results from a bit of chemistry kitchen magic. Here's a look at what Jell-O is made from and how Jell-O works. 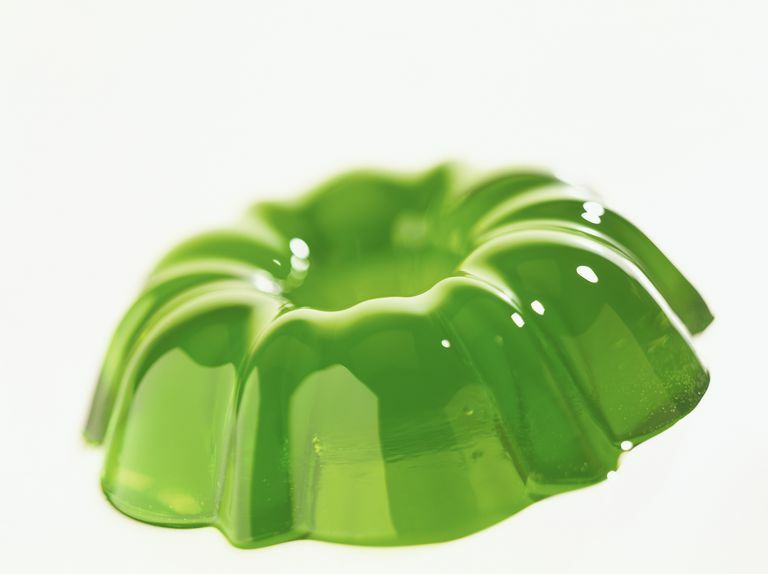 Jell-O and other flavored gelatin contain gelatin, water, sweetener (usually ​it is sugar), artificial colors, and flavoring. The key ingredient is the gelatin, which is a processed form of collagen, a protein found in most animals. Most of us have heard that gelatin comes from cow horns and hooves, and it sometimes does, but most of the collagen used to make gelatin comes from pig and cow skin and bones. These animal products are ground up and treated with acids or bases to release the collagen. The mixture is boiled and the top layer of gelatin is skimmed off the surface. When you dissolve the gelatin powder in hot water, you break the weak bonds that hold the collagen protein chains together. Each chain is a triple-helix that will float around in the bowl until the gelatin cools and new bonds form between the amino acids in the protein. Flavored and colored water fills in the spaces between the polymer chains, becoming trapped as the bonds become more secure. Jell-O is mostly water, but the liquid is trapped in the chains so Jell-O jiggles when you shake it. If you heat the Jell-O, you will break the bonds that hold the protein chains together, liquefying the gelatin again.